A receding hairline, the appearance of bald patches (alopecia), or thinning hair can be a disturbing experience for any person, and knowing how to fight hair loss can be a challenge. Over the last few years, various vitamins and supplements have been promoted to boost hair growth and help hair grow back. For example, biotin, vitamin D, B-complex vitamins, and omega-3 are all said to combat hair loss and help hair regrow. Because we all take pride in our hair, it is worth finding out if these supplements and vitamins can help to grow hair and prevent hair loss, and if they can be used as a natural treatment for alopecia. The vitamins your hair needs are A, D, E, K, C, and the B-complex group like biotin (also known as vitamin B7, vitamin H, coenzyme R) and niacin (vitamin B3). You also need to consume minerals such as iron, magnesium, and zinc for healthy, strong and shiny hair. Before we look at the various vitamins and supplements that can help boost hair growth, let’s look at the reasons why a person can start to lose hair in the first place. There are many reasons why hair can start thinning and bald patches appear. One common reason is a vitamin and mineral deficiency. Dr. Carolyn Jacob, medical director of Chicago Cosmetic Surgery and Dermatology, says that any vitamin deficiency will cause hair loss.2 Also, protein, iron, selenium, copper, and magnesium are all needed for healthy hair to grow and to prevent hair loss. Of course, it is always best to eat a well-balanced diet to get the proper amount of vitamins and minerals that your body needs. There can be other reasons for hair loss like stress, hormone imbalances, extreme weight loss, heredity and cancer treatment, as well as other causes which you can read about in my article discussing the 10 common causes of hair loss. Taking vitamins and supplements can help to make up for any deficiency that is causing hair loss. Although taking supplements for hair loss is a controversial subject, many studies do show a connection between vitamin supplements and hair growth. Biotin is a very popular supplement for hair growth. Biotin (vitamin B7) is part of the B-complex group of vitamins and is a coenzyme which is needed for the body to produce keratin. Keratin is the protein which hair and nails are made from and it is essential for healthy, strong hair. 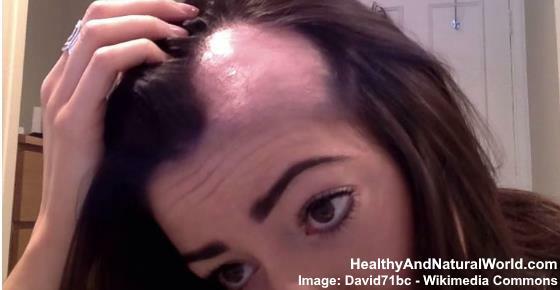 Other studies also found a link between biotin deficiency and hair loss. For example: a recent study form 2016 in Japan found that babies who were fed with baby formula low in biotin levels exhibited alopecia related to biotin deficiency. A study from 2015 found that in humans, biotin deficiency is relatively rare but can cause dermatitis and alopecia. Another study from 2010 found a link between marginal biotin levels and diffuse hair loss. One study published in 2010 found that zinc supplements can help hair to grow back if the hair loss is due to a zinc deficiency. Natural sources of zinc can be found in shellfish, beef, lamb, legumes, seeds and nuts. Vitamin D deficiency can cause several diseases, so it is important that you get enough of this vitamin. Our body can make its own vitamin D from sunlight. You can also get vitamin D from supplements, and a very small amount comes from a few foods you eat. According to the Office of Dietary Supplements, one of the best sources of vitamin D is oily fish like salmon, tuna, and mackerel.11 Talk to your doctor if you’re concerned about the level of vitamin D you get from the sun and your diet. Your doctor can advise if you need to take a vitamin D supplement. Natural sources of B vitamins are dark leafy vegetables, poultry, beef liver, nuts, beans, and avocados. One B vitamin that has proved to be very effective in fighting hair loss is niacin (vitamin B3). Niacin is used by the body to improve circulation, reduce inflammation, and is connected with a person’s hormones. Saw palmetto is a plant that produces berries, and it was found that saw palmetto supplements can help fight hair loss. Saw palmetto contains an ingredient which inhibits the body’s production of a chemical associated with testosterone-related hair loss. When testosterone is converted into dihydrotestosterone (DHT), it shrinks the hair follicles, resulting in shorter and finer hair until, eventually, hair growth stops altogether. If you want to find out more about using saw palmetto for hair growth, please read my article on how to use saw palmetto to stop hair loss and promote hair growth. You will also find there about other natural ingredients that can help to reduce the occurrence of baldness. Coenzyme Q10 (Co Q10) can help to restore hair growth and reduce hair thinning that is associated with aging. The aging process affects the amount of keratin in the hair and this loss of keratin can cause hair to start thinning and bald patches can appear. Using a shampoo enriched with Co Q10 to wash your hair can help to reverse the effects of aging on your hair. Certain fruits and vegetables (apples, berries, spinach, oranges, cauliflower, broccoli, strawberries and black currents). As the CoQ10 is fat-soluble, you should consume it with a meal that contains fat. You can either consume the pumpkin oil itself or around 1.5 tablespoons of shelled pumpkin seeds which are equivalent to 400 mg PSO. How diet affects your hair. How diet affects your hair. Eat right for your hair type. Evidence for Supplemental Treatments in Androgenetic Alopecia. Int J Trichology. 2016 Apr-Jun; 8(2): 73–77. Hair Restoration in Androgenetic Alopecia. Vitamin-boosted stem cells show promise in curing baldness. A pilot study evaluating the efficacy of topically applied niacin derivatives for the treatment of female pattern alopecia. The effectiveness of botanically derived inhibitors of 5AR in the treatment of androgenetic alopecia. Coenzyme Q10 has anti-aging effects on human hair.